Compared to CS4 two of Photoshop CS5’s menus (Edit and Layers) have ‘lengthened’ so that they no longer fit on the screen of my MacBook Pro. Thus, the bottom of the menu is off the bottom of the screen (or the top, if you are at the bottom of the menu). Now, it is true that the Edit menu of CS5 has two more items (32 instead of 30) but the Layers menu has the same number (29 items) as CS4. In CS5 all the menu text items are more widely vertically spaced, leading (pun not intended) to this problem on a MacBook Pro. The screen resolution of my MacBook Pro is set to the native 1280x800, greater than the Adobe “minimum” and at their “recommended” screen resolution (see the CS5 ReadMe). The clincher here is that this does not happen with CS4. If the display of menus can work correctly with these two applications why not with CS5 and ACR 6.6 ? This is certainly a bug which needs fixing. See the explanation from the Camera Raw team above. In terms of the menus being too long, it would help to have that as a separate topic. OS X shouldn't allow menus to flow off the screen. It should add scroll carrots to the top and bottom of the menu to access long menus. When you create a new topic, it may help us to see a screen shot of what you're seeing. The ‘carrots’ show at the top and bottom of the menus as you describe, but this is not the issue. 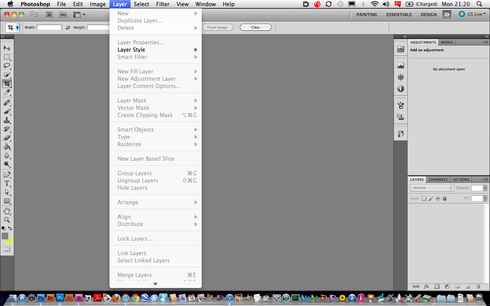 The issue is that the menu of the same length fits on the screen with CS4 and does not with CS5. The screen resolution that I am using is the Adobe “recommended” one. It would be reasonable, therefore, to expect the menu to fit on the screen would it not ? The origins of the error which have led to this bug may be shared by the ACR display issue (ACR window flows into the Dock or Taskbar) since it appears both are related to the screen resolution – the faults not being apparent at higher display resolutions. It would be good if Adobe fixed this particularly issue as it is such a basic fault which should have not got through their quality control. Yes, I take your point. Perhaps this is why CS5 got out the door, so to speak, with its drawers* too big (joke). But this can be easily fixed, I'm sure. It's just a bit irritating, this lack of attention to the basics. And it makes, for some of us, life just a bit more difficult. Allied to the ACR bug (to have to click the resize-window button each time you open a new image) we now have to scroll up and down some menus when you can't find something in the list. Combined with the fact that I felt forced into this upgrade as Adobe were removing the upgrade path, and that I have found some of the new features (from CS4) do not work for me, please forgive me for being not a little grumpy !